Plot Outline: Professional daredevil and white-suited hero, The Great Leslie, convinces turn-of-the-century auto makers that a race from New York to Paris (westward across America, the Bering Straight and Russia) will help to promote automobile sales. Leslie's arch-rival, the mustached and black-attired Professor Fate vows to beat Leslie to the finish line in a car of Fate's own invention. 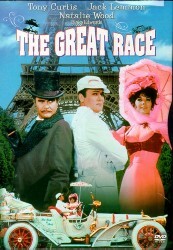 The Blake Edwards style of slapstick and song originated with this movie. A dedication to Laurel and Hardy appears at the beginning of the film. Edwards' tribute to Stan and Ollie can be seen most clearly in the interaction between Professor Fate and his cohort Max, as well as in the operatic Pottsdorf pie fight.